Features: It has the advantages of beautiful appearance, light weight, high strength and portability. The unique design of the outer body sliding piston double O ring ring, pump body wall smooth, enhances sealing and pumping performance. The utility model has the advantages of high inflation efficiency and high pressure. Leather bowl is not easy to damage. Good durability, pump does not rust, do not fade, almost no maintenance. Spare parts service life is very long, can guarantee more than one hundred thousand times the number of inflatable, use life about 10 years. Wide range of work, below zero 30℃ to 50℃, whether it is cold and dry winter, or hot and humid summer does not affect the use of. The utility model has the advantages of easy inflation, stable structure, novel appearance and strong sealing performance. Pressure test up to 1.6Mpa (16 ATM), the general limit in the use of 0.8Mpa. (1MPa = 145psi) Specifications: Material: High Strength Plastic Color:black and orange Size: Contraction is 14.5cm. 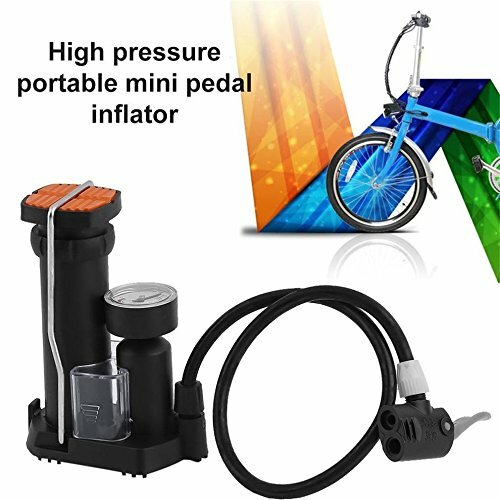 The expanded state is 23.5 cm Package size：15.5*11*7.8cm Max pressure: 7bar Package includes: 1 x bike Pump 1 x Box Notes： 1. Due to the difference between different monitors, the picture may not reflect the actual color of the item. We guarantee the style is the same as shown in the pictures. If you have any questions about this product by CLKJYF, contact us by completing and submitting the form below. If you are looking for a specif part number, please include it with your message.